I’m not sure what I love most about FKA Twigs (Formerly Known As Twigs) since I don’t personally “know her” — I’ve been a fan of FKA Twigs since I first heard “Water Me” off EP 2, so it’s great to have seen her grow from relative obscurity to the limelight. 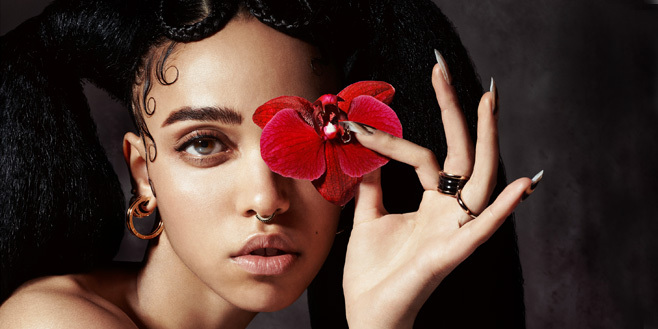 I don’t think it has much to do with dating a certain vampire celebrity either — FKA Twigs just happens to be one of those rare specimens that has the full package of immense talent (she produces her own music), used to be a back-up dancer for Nicki Minaj and other huge acts, and is also just superbly creative. Annoyed with the label of “alternative r&b” FKA Twigs fights back those who try to put her in a certain box that’s neatly labeled. There’s a lot of facets to her, and her music is brimming with emotion and color, to put her down as purely an alternative hip-hop artists is lazy. In her songs you can hear a myriad of influences including ballet, old black and white movies, Jamaican dance hall music and more .